While I was writing my last blog, I was still in full season preparation mode. Now, one blog later, the season is in full swing and the first few race kilometers are in the legs. Mainly cobbled kilometers. That’s why during the last few weeks Belgium, especially Gent, became some sort of a second home for the team and me. It´s either staying there in between races or short two to three days visits at home before you travel back to Belgium and the race hotel. Since I decided to leave Girona and moved back to Germany in March, my traveling became very relaxed. I can train- instead of plane-travel and it takes me about 5 hours from door to door. One of the main reasons why I decided to move back. As I mentioned in one of my former blogs: the traveling takes a huge part of a cyclists daily life and race routine. So the more relaxed the travel, the better your legs and your mind might feel on raceday. What does a (pre-)raceday in the life of a pro cyclist look like?! It starts, as mentioned, with the travel. Usually we arrive in the hotel the day before the race some time around afternoon. Depending on when you leave home in the morning, you already did your pre-race spin or you make up for it right after your arrival. This is followed by some stretching, massage and mainly some Netflix session with your roomie and the legs up the wall. Depending on when we leave the hotel in the morning, breakfast time is pretty individual according to every ones sleeping and digesting habits. Since I am less relaxed and more nervous than other girls, I like to pack my bag the evening before the race and I rather get up and eat early, even though I am not an early bird at all. Most of the time I´m ready to leave ahead of time and force myself to stay in the room for longer than I actually would or feel comfy with. We head to the race with a Sprinter containing the bikes and all the gear, the camper with the girls and at least one race car with wheels and spare bikes. As soon as the engines are started I check several times if I got everything in my bag, although I already double-checked it in the evening and once more in the morning before leaving the room. Some might call is obsessive. I’d call it precise. If I feel happy with the content of my bag, I pin my number. Most of the time, we arrive around an hour before sign-in. Just enough time for us girls and the staff to get ready. We change in the camper, fill our jersey bags with the radio, gels and bars according to the length of the race. Our “swannies” Lars and Ale, at least during the cold races, prepare our legs with oil. 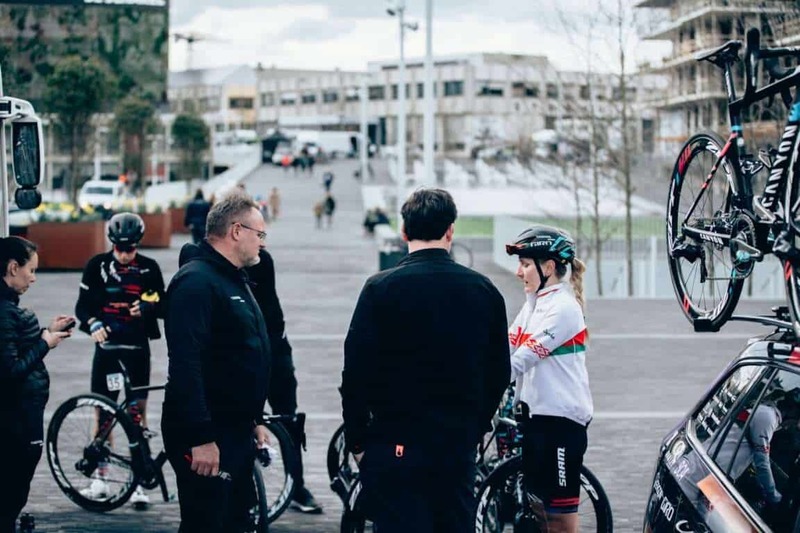 When everyone is ready, we grab our bikes, already perfectly set up thanks to our mechanics and swannies and leave together to sign in and to line up at the start line. The following few hours is what luckily can be seen on more and more livestreams these days. Let´s hope this positive development keeps on growing. Right after the finish line Lars or Ale are already waiting for us with some drinks and jackets and tell us the way to the camper. That’s where the hurry starts. In general we travel back home right after the race, so everyone has a plane or a train to catch. That means: using baby wipes against the dirt and the sweat, putting on some dry clothes and grabbing a lunchbox for the travel, also prepared by our lovely soigneurs. That feels like the right moment to say sorry to all the people sitting next to me in the plane last season, when even the baby wipe action and getting changed took too much time. Flying in bib-shorts is not as comfy as it might sound, eventhough the chammy does make Ryanair seats softer. So due to this, it might happen, that we do not even see our teammate, who made it to the podium, before we have to leave. The prize for spending the night and doing the recovery spin in the morning at home. And as you now know: We will eventually meet again two or three days later. Somewhere in Belgium. Somewhere around Gent. 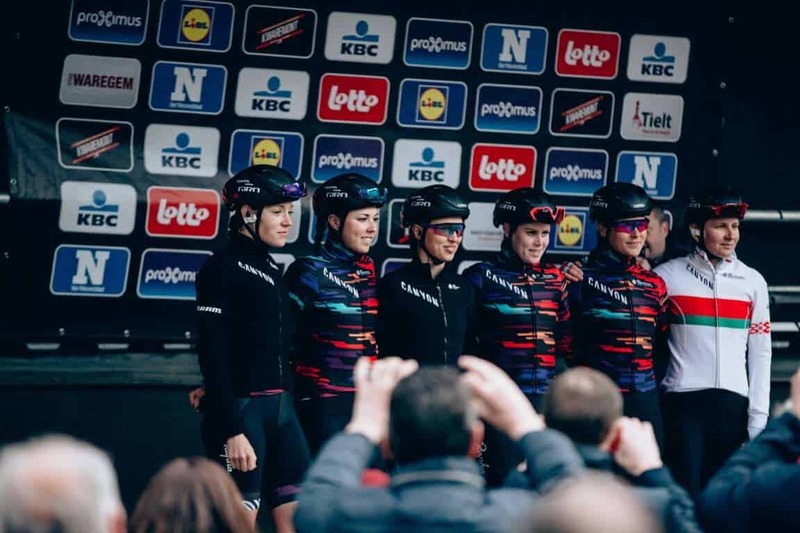 Keep yourself updated about all the racedays on Instagram @taennele or @wmncycling.